Chief Minister Pema Khandu today called for a concrete timeline and adherence to it through a well-coordinated approach by all stakeholders to successfully complete implementation of the ambitious Pradhan Mantri Sahaj Bijli Har Ghar Yojana – ‘Saubhagya’ – on time in Arunachal Pradesh. The ‘Saubhagya’ scheme was launched by Prime Minister Narendra Modi on 25th September 2017 to provide free electricity connections to all households (both APL and BPL families) in rural and urban areas. There are around 4 crore un-electrified households in the country and they are targeted for providing electricity connections by December 2018. In a meeting with Rural Electrification Corporation (REC) – which has been designated as the nodal agency for Saubhagya – here this morning, Khandu asserted that in order to meet the December 2018 deadline, REC need to work in tandem with the state Power department and various works should be executed concurrently. He also insisted that the households should not only be equipped and wired but also be ‘lighted up’ for the scheme to be a complete success. The meeting was also attended by Power Minister Tamiyo Taga, Chief Secretary Satya Gopal, Finance Commissioner Kaling Tayeng, Power Commissioner G S Meena, REC officials headed by Chairman and Managing Director Dr P V Ramesh, state Power Chief Engineers and Superintendent Engineers. While reminding that the Prime Minister is very much concerned about successful implementation of the scheme, Khandu requested the REC CMD to handhold the state government as the geographical and climatic conditions of the state can prove major hurdles in completion of field-works on time. He assured that the state government will mobilize all resources available to achieve 100% electrification of all households in the state by December 31st this year. The scheme in Arunachal Pradesh will provide electrification to 44806 unelectrified households across the state which includes 14113 connections to BPL households. While 39376 will be on-grid connections, 5430 will be off-grid. 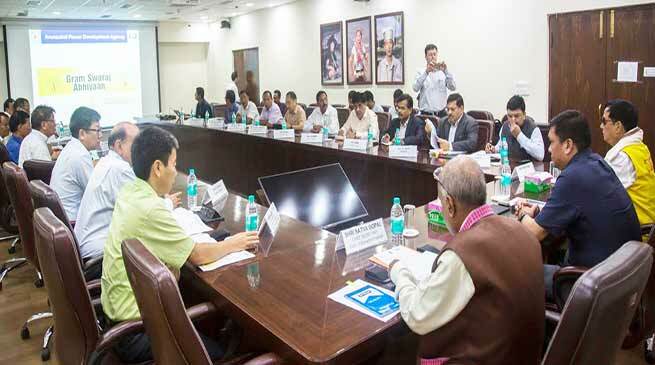 Referring to the Aspirational District scheme under Gram Swaraj Abhiyan (Phase II) of the center, which aspires to electrify Namsai, the selected district under the scheme, by August 15, 2018, Khandu urged REC to complete wiring in all left-over households by July-end so that the entire district is electrified as scheduled. Dr Ramesh, on behalf of the REC, assured the state government of complete cooperation while informing that REC has established an office at Itanagar for the sole purpose of implementing the scheme successfully in the state on time. He sought cooperation and coordination from the state Power department officials and district administrations, to which the Chief Secretary assured directives will be immediately forwarded to all the deputy commissioners in this regard.